LYRA Stylus Performance Treatment (SPT) is a purified water-based, non-alcohol stylus cleaner that helps keep cartridge styli scrupulously clean. In addition to highly purified water, SPT contains only very small amounts of organic chemical cleaning agents. SPT has proven to be completely safe to use with all phono cartridges (not only LYRA's). Whatever the cartridge, excessive amounts of liquid should never be applied to the stylus and cantilever. A key component of SPT is the accompanying brush which has been designed with super-soft bristles. Thanks to the bristles it is OK to drag the brush across the diamond stylus of the cartridge. Most other stylus brushes on the market have harder bristles that are not gentle with the diamond stylus, and could potentially cause damage. Even the LYRA brush must not be allowed to come into contact with any other part of the cartridge. Upper models of the LYRA cartridge range such as the Skala and Titan i come with a free bottle of Lyra SPT. 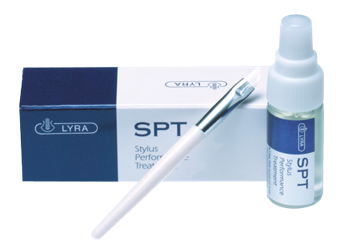 For other models, and for refills, Lyra SPT is available as a separate product from your local Lyra distributor/retailer.